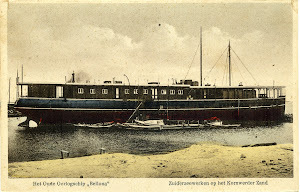 An item dated Batavia, Dutch East Indies 29th reported the arrival of the Dutch screw steamship Noord-Braband master Mets coming from Rotterdam, Netherlands and Padang, Dutch East Indies, shipping agents Rotterdamsche Lloyd. 1. Net capacity 5.055,56 cubic metres/1.784,61 tons of 2,83 cubic metres, homeport Rotterdam, Netherlands and call sign PNBF.